Burts Bees Mens Soap Bar invites you to wake up in the morning with an invigorating buzz. 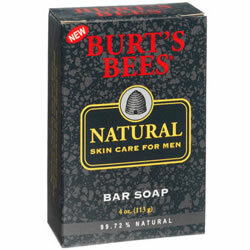 Burts Bees Mens Soap Bar gives an intense clean, with this energising and purifying soap that washes away dirt and odour, leaving your skin refreshed. Lemon, Orange and Petitgrain oils cleanse skin, while Rosemary extract and Fir oil revive and invigorate for skin that looks, feels and smells its natural best.